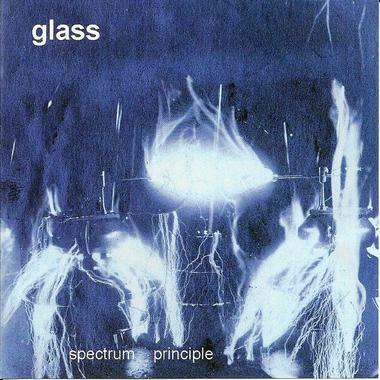 Glass – "The Spectrum Principle"
There is a point on the latest Glass album, The Spectrum Principle, about halfway through, where the music gracefully transitions from the freeform experimentalism of Emptiness to the lush, sweeping and cinematic Fulfillment. It’s a magic moment that perfectly encapsulates the nature of album: the fine balance between chaos and structure, between silence and deafening volume; cause and effect; insanity and sanity; loneliness and togetherness; death and life…indeed, between emptiness and fulfillment. The three-piece band walk a tightrope, with drummer Jerry Cook (who produced the album, and whose ideas The Spectrum Principle emerged from) as the fulcrum, and brothers Jeff (bass, guitar and keyboards) and Greg Sherman (keyboards) keeping the balance on either side. From the opening experimental textures of Prism to the rising, solemn but hopeful album closer, Destiny, the band keeps this balance, exploring jazzy, Canterbury-esque progressive rock with the mesmerizing and quite catchy Apathy and the jaunty Quest to more avant-garde territory with the percussive investigation that is Saturation and the dark and moody, freeform soundscapes of the aforementioned Emptiness and the title track. In between lay the other spaces, the lounge meditation of Blue Wednesday and the intense nerviness of Edge. Even the very psychedelic Atonement, which zigzags through its keyboard rock theme with pastoral folk, dissonance, and half-crazed jamming finds its place in the balance. After all these years, from the 70’s through to rebirth at the turn of the millennium, this is Glass at its finest. Who says only wine and cheese get better with age? In fact, Glass is like the wine and cheese of progressive rock: perfectly aged; complex in color and flavour, with a tantalizing bouquet; sometimes hard, sometimes soft; sometimes sharp, and other times mild; classy and sophisticated, yet accessible to the common man. We often talk of the times when a band was in its heyday, producing the best and most enduring albums of their career. Well this is where Glass is, right now, folks. Enjoy it and savour it. The Spectrum Principle is a breathtaking album.